SHORTLISTED FOR THE WELLCOME BOOK PRIZE Gaslight tales of rooftop escapes, men and women snatched in broad daylight, patients shut in coffins, a fanatical cult known as the Abode of Love... The nineteenth century saw repeated panics about sane individuals being locked away in lunatic asylums. 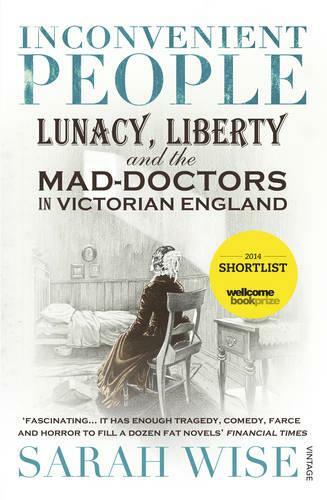 With the rise of the `mad-doctor' profession, English liberty seemed to be threatened by a new generation of medical men willing to incarcerate difficult family members in return for the high fees paid by an unscrupulous spouse or friend. Sarah Wise uncovers twelve shocking stories, untold for over a century and reveals the darker side of the Victorian upper and middle classes - their sexuality, fears of inherited madness, financial greed and fraudulence - and chillingly evoke the black motives at the heart of the phenomenon of the `inconvenient person'.